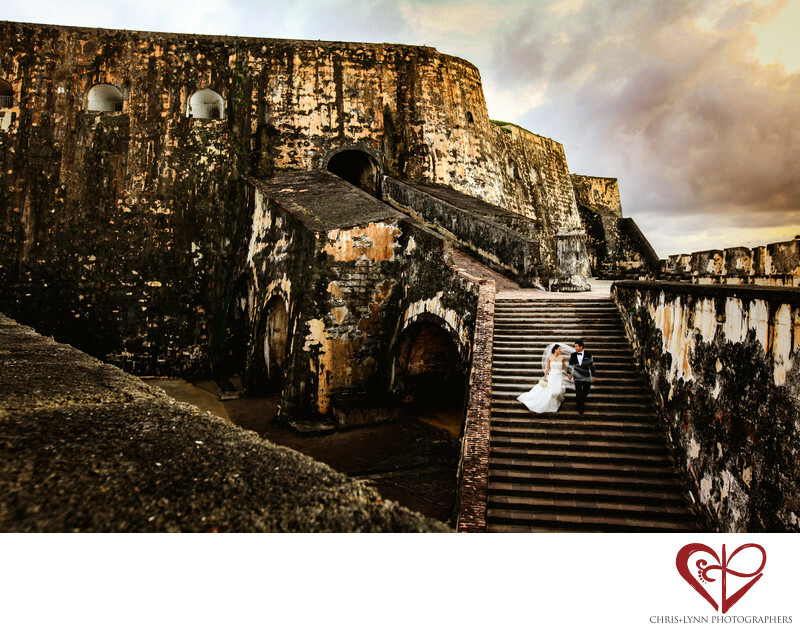 Morro Castle, also known as Fort San Cristóbal is a World Heritage Site and the site of many battles over the past three hundred and fifty years; it is also an incredible location for wedding photography! The 16th century citadel was originally built to protect the port of San Juan, and now is a popular tourist attraction. It includes main plaza with lovely yellow walls and arches, a lighthouse, and multiple battlement stations along the wall. We loved exploring this location with our destination wedding couple. The shapes, textures, and scale of this centuries-old castle made it a dramatic setting for their portraits. The triangles and converging lines stablilize the composition of this image and direct the eye to the couple on the stairs. The tangled veil around the bride and groom adds energy. We call this type of photo - where the couple is smaller within a grand setting - a lovescape, and it is a signature shot for us on all destination weddings. We love to print it big - sometimes 40 by 60 inches for couples to have as artwork on their wall. 1/640; f/5.6; ISO 800; 27.0 mm.